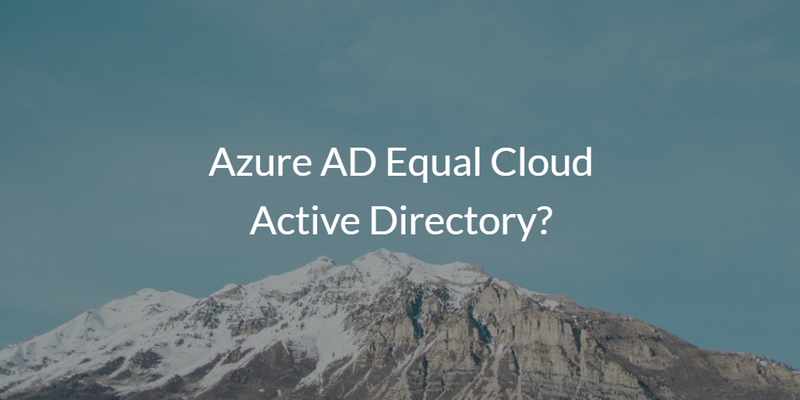 Azure AD® Equal Cloud Active Directory®? Home » Blog » Azure AD® Equal Cloud Active Directory®? A critical question is coming up for many IT organizations as they make the shift to the cloud. Is Azure Active Directory® equal to a cloud Active Directory solution? It’s a great question and one that deserves some attention. There are simply too many benefits to shifting to the cloud for organizations to ignore the possibility of eliminating their on-prem Active Directory instance. We should start with some history. Microsoft Active Directory® was released in 1999, in a world where Windows devices were everywhere in the enterprise. At the time the Internet boom was underway, but the concept of the cloud hadn’t taken hold yet. Most IT networks were Windows-based and on-prem, and Microsoft created AD with those requirements in mind. As a result, their solution tightly integrated with Windows, but not other operating systems or platforms. Fast forward to 2010 and Google, Apple, and Amazon were all challenging Microsoft’s “status quo”. Google’s solutions – G Suite (formerly known as Google Apps for Work) and Google Cloud – along with AWS were putting tremendous pressure on the Microsoft Office franchise and their ability to control the server market. Apple’s Mac platform and the open source Linux distributions were taking a tremendous chunk out of the Windows monopoly. At this point in time, only one in five devices in companies was Windows (Forbes.com) – a dramatic change from where things were before. This pressure from competitors eventually lit a fire under Microsoft. In 2010, they debuted Microsoft Azure as their cloud platform. One year later, in 2011, they took a stab at Google Apps when they launched Office 365, the cloud-based iteration of their popular productivity suite. While Office 365 has been widely adopted in the years that followed, Microsoft Azure Active Directory has had a more lukewarm reception in the enterprise. Azure AD is not the replacement to Active Directory that everyone thought it would be. As you can see from this Spiceworks post from a Microsoft representative, Azure AD is an adjunct to the main solution, Active Directory. Microsoft wants to maintain their control of the enterprise through Active Directory, and they are doing this by pushing people to their cloud infrastructure in Azure. Of course, this concept still requires users to own the operating system and drive Windows and Office 365 adoptions with the use of both versions of Active Directory. In other words, Azure is designed to serve as a complement to Active Directory, not to replace it altogether. IT admins on the cloud identity management path shouldn’t look to Azure AD for a cloud AD equivalent. Cloud Active Directory is an interesting concept, but it only exists as a managed service or virtual AD solution from third party providers. Microsoft, in a sense, doesn’t have a complete cloud directory services solution or approach. Their concept is to leverage the on-prem Active Directory, and connect that to the user management solution Azure AD. If you are interested in a true cloud directory or cross-platform version of cloud Active Directory, you’ll need to look at the cloud identity management solution Directory-as-a-Service. As a modern IDaaS platform, Directory-as-a-Service securely manages and connects employee identities with the IT resources they need. 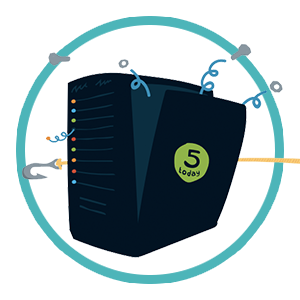 This includes their systems (Windows, Mac, Linux), cloud and on-prem servers, web and on-prem applications, and wired and WiFi networks. In fact, as a cloud directory service, the virtual identity provider DaaS is LDAP-as-a-Service, cloud RADIUS, multi-factor authentication, SSH key management, system management solutions, and more all in one product. In a sense, think of Directory-as-a-Service as Active Directory reimagined for the cloud era. If you would like to learn more about whether Azure AD is equal to cloud Active Directory, drop us a note and we can walk you through what these solutions are and how they can work in your environment. We can also discuss what a true cloud identity management solution looks like in today’s modern IAM sector. Alternatively, if you would like to experiment with an Active Directory replacement, sign-up for a free JumpCloud IDaaS account. Your first 10 users are free forever.